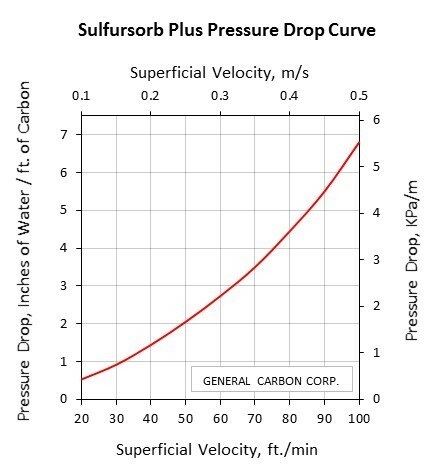 GC Sulfursorb Plus carbon is a non-impregnated, activated carbon which has been specially developed for removing Hydrogen Sulfide and Sulfur compounds from air streams. It is well suited for use in sewage treatment plants and pumping stations where these compounds are typically found. GC Sulfursorb Plus gives you the high loading rates of impregnated carbons without the thermal risks associated with some chemically treated carbons. *H2S capacity is measured using ASTM standard method D6646-01. Testing requires passing a moist air stream containing 1% by volume H2S through an appropriately sized column (per ASTM requirements) packed with activated carbon and monitoring to a 50 ppmv H2S breakthrough. Results are reported as grams of H2S adsorbed per gram of activated carbon. Standard packaging is in 40 or 1000 lb. bags. Other packaging is available upon request.